SCS Software's series has its grand homecoming, and a slim initial release doesn't quite hold back its measured majesty. A great start, but American Truck Simulator will really begin to take shape when more states and trucks are added. So, while it may not be possible to go from Phoenix, Arizona all the way to Tacoma, it is possible to go from Oakland to Sactown, the Bay Area and back down. And that's just fine. American Truck Simulator may seem a little bare right now, with just two states and three trucks, so it's hard to recommend to newcomers over the sublime Euro Truck Simulator 2. That said, those that enjoyed hauling in Europe will no doubt find enjoyment on the other side of the pond, with new cargo awaiting them and new cities to explore. There aren't many games out there that I'd spend several hours creating a Spotify playlist for. But American Truck Simulator scratches the exact same itch that Elite: Dangerous does. While they're vastly different games, both evoke a sense of the wide open road, of the perfect road trip. Both give you freedom and put you in control of your own destiny and your own direction. Both are ridiculously compelling and they let you set your own pace. American Truck Simulator is a simulation of driving a truck across America, and while it can claim many successes in terms of mechanical authenticity, its most effective simulation is state of mind. That zen-like focus and calm of driving, when every other worry evaporates from your mind. Only the road. Only the music. The music and the road as one. American Truck Simulator remains an authentic and gratifying production, one of the few simulators out there still worthy of positive attention. Few games attempt to channel the myths of the open road, the feeling of going nowhere in particular much too fast. The game has realism written all over it. You steer, accelerate, reverse, use headlights, set the headlights, rest when tired, pay fines from the police, and much more. American Truck Simulator is a great game for listening to podcasts while driving around a virtual simulacrum of Nevada and California. It has some flaws, but the overall presentation was fantastic and very enjoyable. Live the dream... jump in your big rig and travel all over the countryside. While a little more realism would make American Truck Simulator more fun, paradoxical as that may sound, there's no escaping how fantastically playable it is. What's here I wholeheartedly admit is fantastic, but we find ourselves in a Street Fighter V-esque situation where we're waiting for the full package. The budget pricing for American Truck Simulator goes a long way to assuaging these fears, and there's still potential for dozens of hours of gameplaying for aspiring truckers. On a personal level I'd be tempted to wait and see how this shakes out - will you have to buy every state? What if I buy New Jersey, will I have to buy every state in between there and Nevada to do a long haul? What about Canada and Mexico? There's a lot of unanswered questions, but provided SCS Software remains true to its word, you're guaranteed to having a trucking good time. American Truck Simulator offers a decent big rig experience for an agreeable price, but it's underwhelming if you consider the existence of ETS2. Driving is inefficient, extortionate, and most people are garbage at it, including myself. I couldn't comprehend why anyone would endorse the lie of the open road. American Truck Simulator reflected the anxious reality, but also allowed me to appreciate the grandeur of it all. 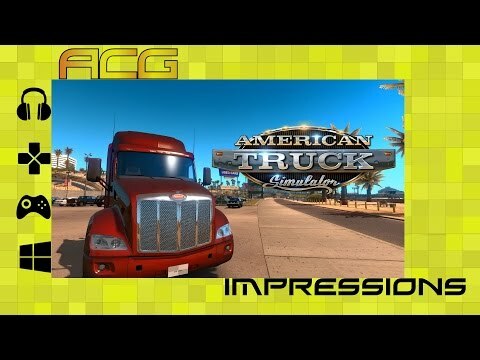 If you bought ETS2 as a bit of a lark, like I did, and were thoroughly sucked in by it, as I was, then you should absolutely get American Truck Simulator.